ORE Pty Ltd is proud to offer high quality pXRF kits at affordable prices. Eight thematic kits are available based on commodity and mineralisation style or you can design your own custom kit from a range of 212 OREAS CRMs. January saw the release of six new epithermal Ag-Cu-Au ore CRMs (OREAS 600 series) and two medium grade Mn ore CRMs (OREAS 171 & 172). This month five new VMS Zn-Pb-Cu-Ag-Au ore CRMs have been released (OREAS 620 series - our catalogue has been updated to include these new CRMs). The release of six new carbonatite-hosted REE ore CRMs is imminent. A suite of four Cu-Au oxide ore CRMs will follow in early May. Three greenstone-hosted Au ores will be available (3.0ppm, 3.5ppm and 6.6ppm Au) around April. Merensky Reef PGE ore material is currently in transit to our premises to develop into a suite of CRMs (anticipated certification date Q3). Another suite of IOCG CRMs will be developed in Q2 (for Q3 release) to replenish our existing stock (see OREAS 59a, 59b, 59c and 59d). OREAS 460 to 465 (ranging 0.5-10% TREO) are sourced from Lynas Corporation's Mount Weld Mine in WA, Australia. Certified products available late February 2015. OREAS 905 to 908 consist of oxide copper-gold ore sourced from MMG’s Golden Grove deposit in Western Australia. Certificates are expected to be available in early May, 2015. Target grades shown below. OREAS 214 to 216 consist of primary gold ore sourced from Doray Mineral’s Andy Well deposit located north of Meekatharra in Western Australia and blended with Cambrian greenstone from Heathcote quarry in northern Victoria, Australia. Certificates are expected to be available Q2, 2015. Target grades shown below. Certificates are expected to be available Q3 2015. Before the festive season begins six new epithermal Ag-Cu-Au ore CRMs (OREAS 600 series) and two medium grade Mn ore CRMs (OREAS 171 & 172) will be released. And in January 2015 five VMS Zn-Pb-Cu-Ag-Au ore CRMs will be released (OREAS 620 series) . In February six carbonatite-hosted REE ore CRMs will be available and a new suite of Cu-Au oxide ore CRMs. Further down the track of 2015, three greenstone-hosted Au ores will be available and we hold high hopes of securing Merensky Reef PGE ore material to develop into CRMs. Many of these suites will come under the SuperCRM classification we introduced last year (i.e. incorporate full ICP-OES and ICP-MS suite certifications). The suites to be released are shown below along with a brief description and their expected grades. OREAS 600 to 605 are sourced from Evolution Mining’s new Mount Carlton operation in Queensland, Australia. Available as certified product December 2014. Target grades shown below. OREAS 620 to 624 are sourced from MMG’s Golden Grove mine in Western Australia. Available as certified product mid January 2015. Target grades shown below. OREAS 171 and 172 are sourced from the Groote Eylandt Mining Company’s (GEMCO) Mn deposit situated in the Gulf of Carpentaria off the coast of Australia’s Northern Territory. Certificates are expected to be available late December, 2014. Target grades shown below. OREAS 460 to 465 (ranging 0.5-10% TREO) are sourced from Lynas Corporation's Mount Weld Mine in WA, Australia. Certified products available February 2015. OREAS 905 to 908 consist of oxide copper-gold ore sourced from MMG’s Golden Grove deposit in Western Australia. Certificates are expected to be available in March, 2015. Target grades shown below. Certificates are expected to be available Q3 2015 pending supply of material. 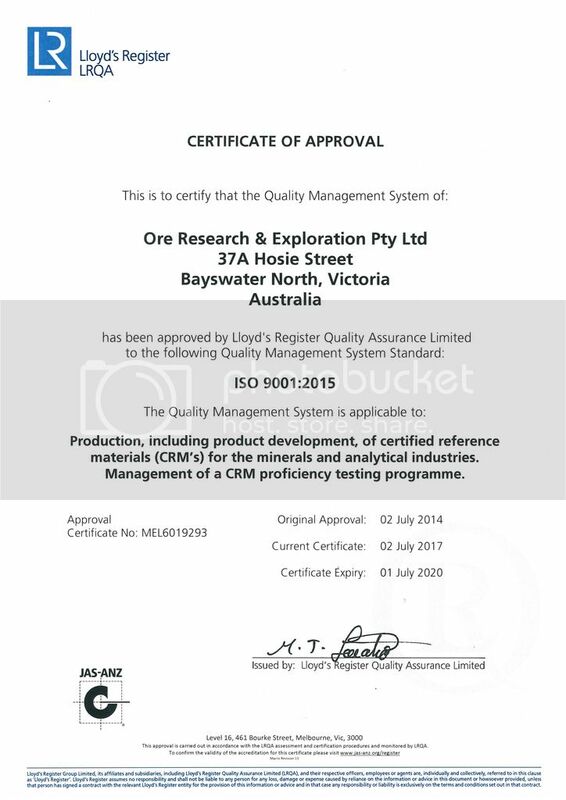 ORE P/L is proud to announce accreditation to the new ISO 9001:2015 for its quality management system including development, manufacturing, certification and supply of CRMs.